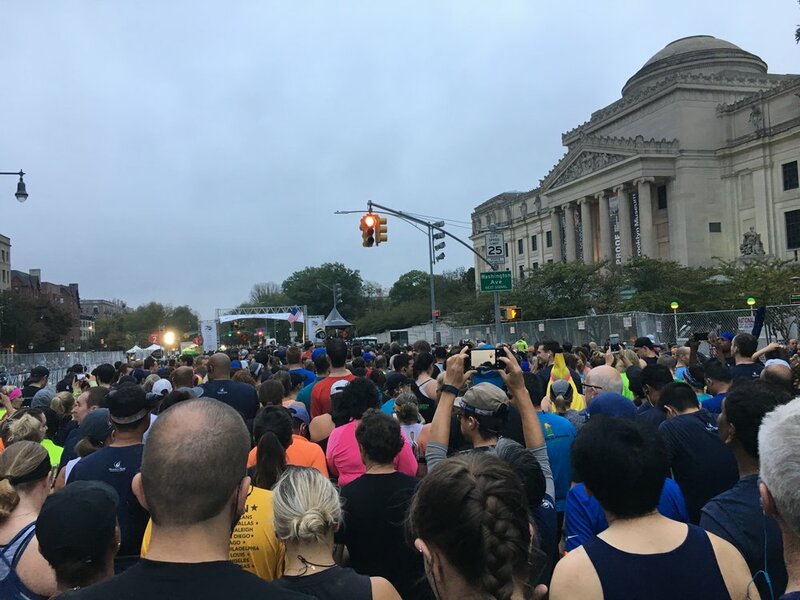 I've run each of the races RnR has put on in Brooklyn. 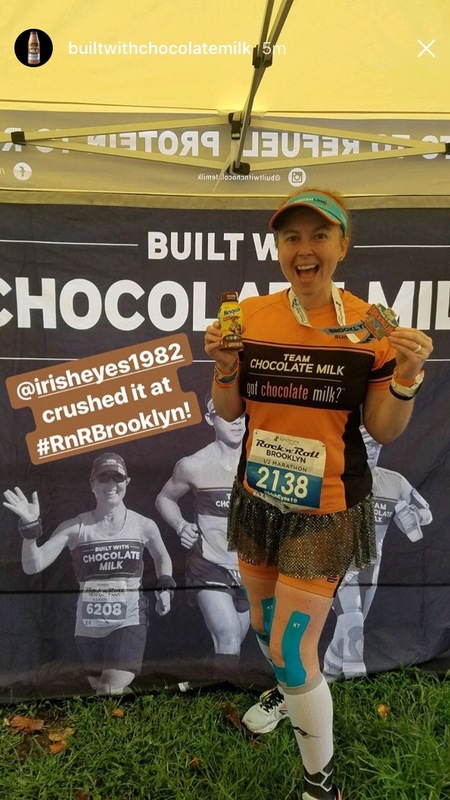 RnR kicked off their time in Brooklyn with a 10k in 2013 before taking 2014 off to turn the 10k into a half marathon. So I was back in 2015 and 2016 for the half, naturally. 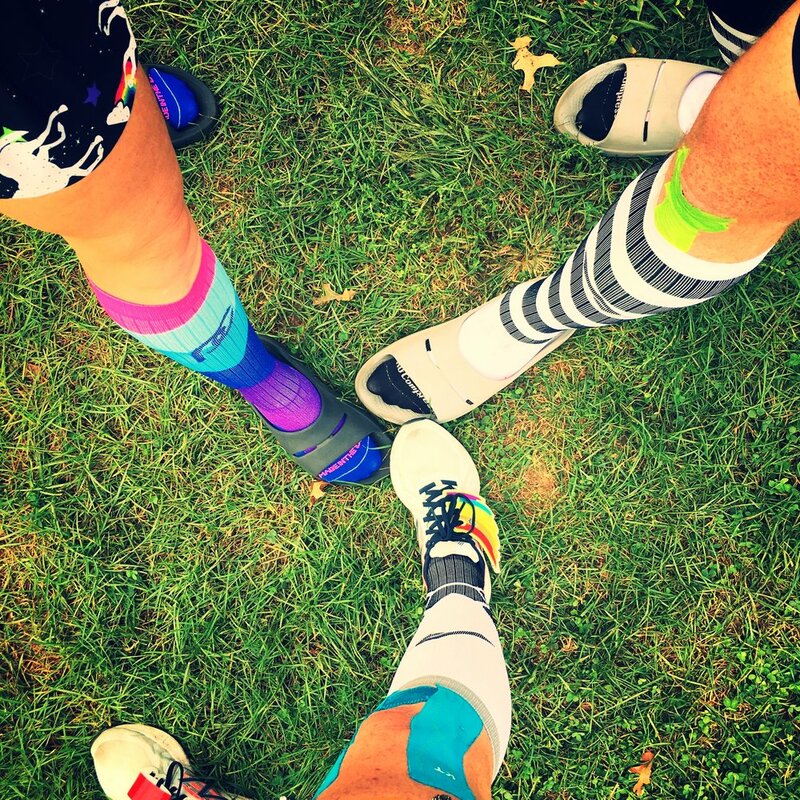 For me this race is more than the course, but it is about the friends I see during and after the race as well as the fun burrough it brings you through. Like in the years past, I took the train down to NYC on Friday morning before meeting up with friends for the Expo and lunch. 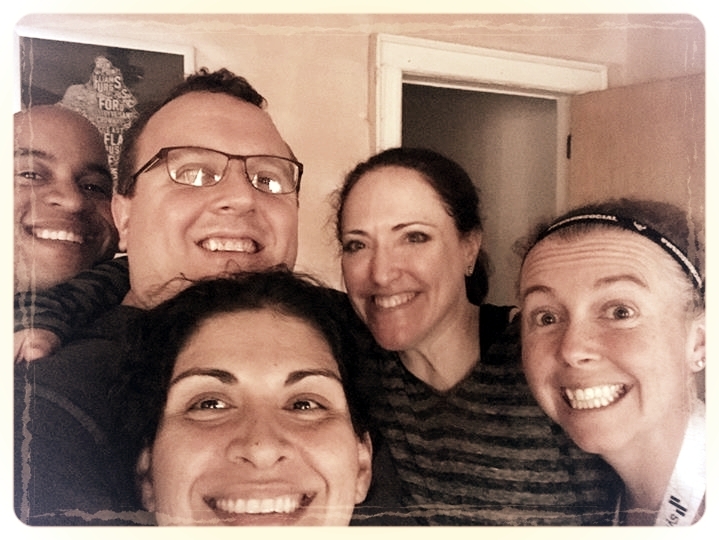 My awesome friend and fellow blogger Margo (@brooklynfitchick) let me crash on her couch for the second-straight year. She lives just around the corner from the race and it is the BEST location for race morning! Finally Andrew (@smartwatermelon), Briana (@matmilesmedals) and I headed out to go through security. Each year the security lines improve from the prior year. This year they added a VIP lane for those with the VIP wristband. We made it through security in decent time and headed towards the corrals to meet up with Libby (@runninboots). Now the issue with the corrals this year is the divide between the corrals was unclear. So while we walked between the port-o-potties and people, we thought we were pushing our way along the corrals when we hit people after people just standing there. It seemed like we were pushing our way up to our corral IN the corrals rather than next to it. The corral lane definitely wasn't clearly marked which was disappointing. Thank goodness I wasn't pushing up to the corral I was supposed to start in or I might not have gotten there in time. Hopefully they can work on signage next year. While Andrew was going to "race" the half, Briana, Libby and I were on the dance party/pic/Instagram train. Briana was taking over the official race Instagram stories for the weekend as she tackled Brooklyn-Denver. She, Andrew and Briana were all running Brooklyn on Saturday and Denver half on Sunday. So I was with Briana and Libby for the fun! Plus I had run Chicago Marathon the week before and wanted to enjoy a 13.1 mile tour through Brooklyn with friends. Alright gang time for a 13.1 mile part-ay! What I gathered from Briana, the course would be the same as the year prior. 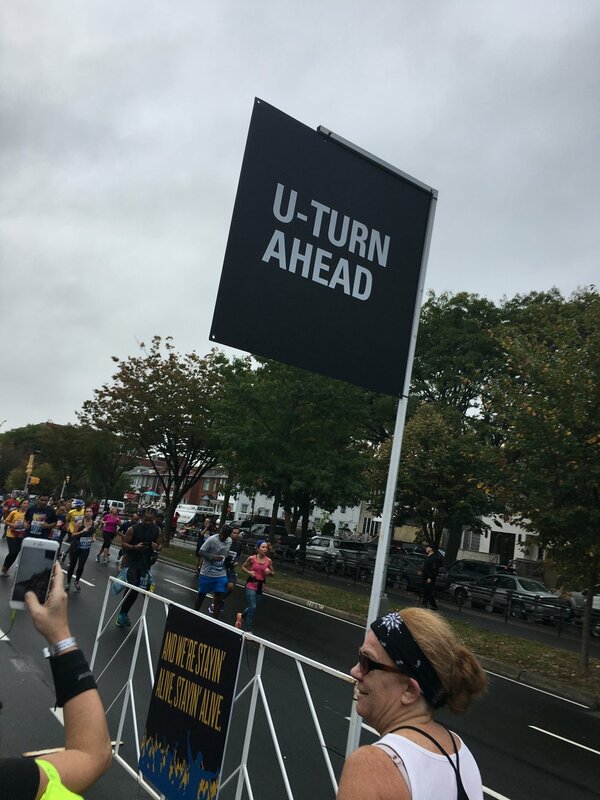 What most people don't really on the first out and back which is the first 2 miles, is that the road goes on a slight decline for the first mile then you turn around and enjoy a slight incline for the second mile. Haha. Way to be tricky Brooklyn! Always fun to see familiar faces and fellow Rock N Bloggers on the course! Brooklyn volunteers always bring their A-game, but this year the cup game was ON POINT! 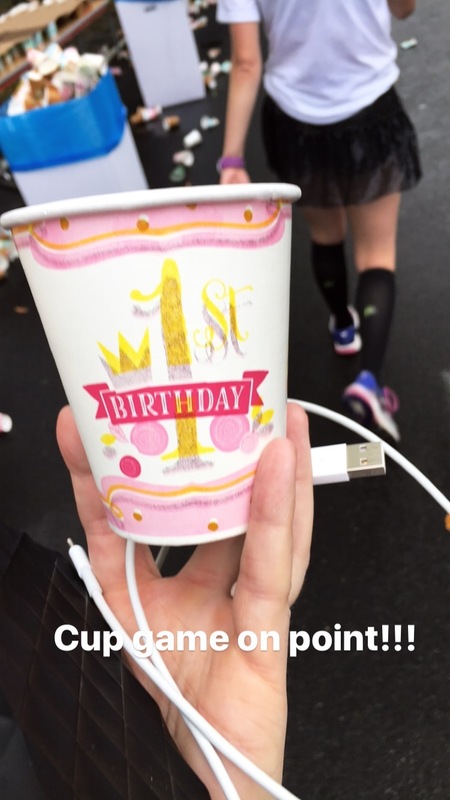 When at a water stop, don't you stop to cheer on participants and video your friends? I was also trying to keep an eye out for my physical therapist/trainer/friend Zak and his sister Sam, both were running their first half marathons. Just as I was scanning the crowd, I heard Zak!!! I wished them well and hoped I would see them during the upcoming out and back! 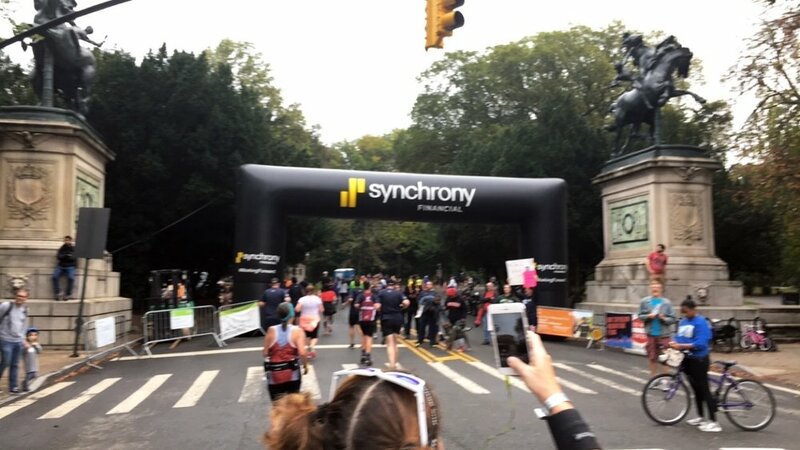 Once you hit Mile 4, it is time to start the out and back stretch on Ocean Parkway! This isn't the most scenic or glamorous stretch of land, but the bands and volunteers along the way bring the neighborhood alive. There were high school marching bands, local bands and some high school dancers. During Mile 6 we briefly lost Libby to a bathroom stop so Briana and I took the chance for a walk and Instagram break. I felt like a director helping Briana with the IG stories. Oh boy time was flying - well not literally, but since I hadn't looked at my watch once - I was shocked that we were already halfway through the race. Alright we were past the turnaround and making our way back to Prospect Park. I had to do a little sprint work catching up to Briana and Libby, but I made it. My knees were not happy with me. I should NOT have worn my marathon shoes for "just one more race." Okay it would've been fine for another 5k but another half was TOO much! My knees were done with it. I had to power through now. But the inspiration of the people around me was all I needed. Especially as we approached Mile 9 of the run and saw the final participant coming our way. Now Briana and Libby were on board with stopping at every water stop since it was a tad humid out. After a dance break to shake the legs out, it was time to head off Ocean Parkway, up the on ramp and off to Prospect Park. For those that don't know the last 5k of the run is up the hills in Prospect Park. Alright self it was time to soak up the last 5k part of the run with friends. Since I'm moving, this is now a tour of final runs with friends and enjoying their company. 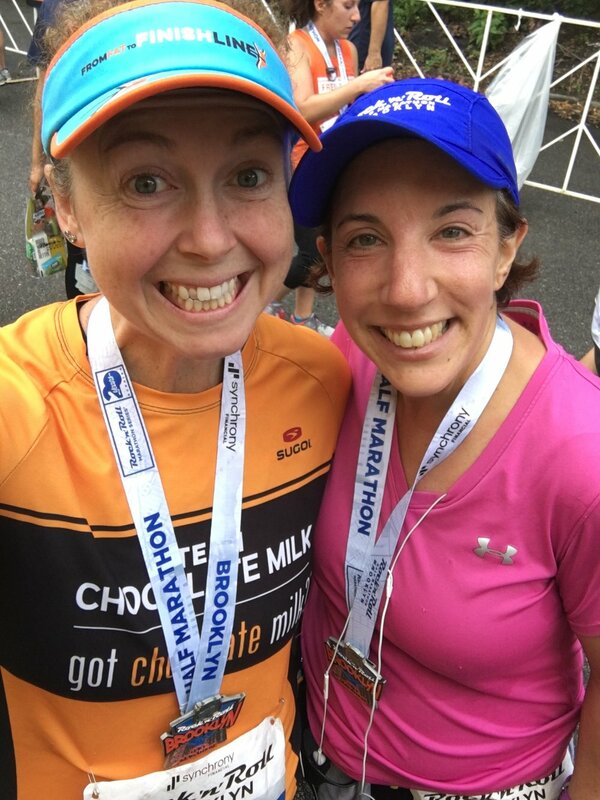 Chatting with Briana (who was going for her gold record that day - medal for her 10th RnR in 2017) helped take away the thoughts of the hills we were trudging up one foot at a time. Now the last 2 miles was rough for me. I was having some tummy issues that actually sent me to the port-o-potty at Mile 12. It has to be bad to stop that close to the Finish Line. Lucky once I was out I was feeling better and able to do a little speed work to catch up to Briana. We started together and were really hoping to Finish together as well... and we would get to! Yay! 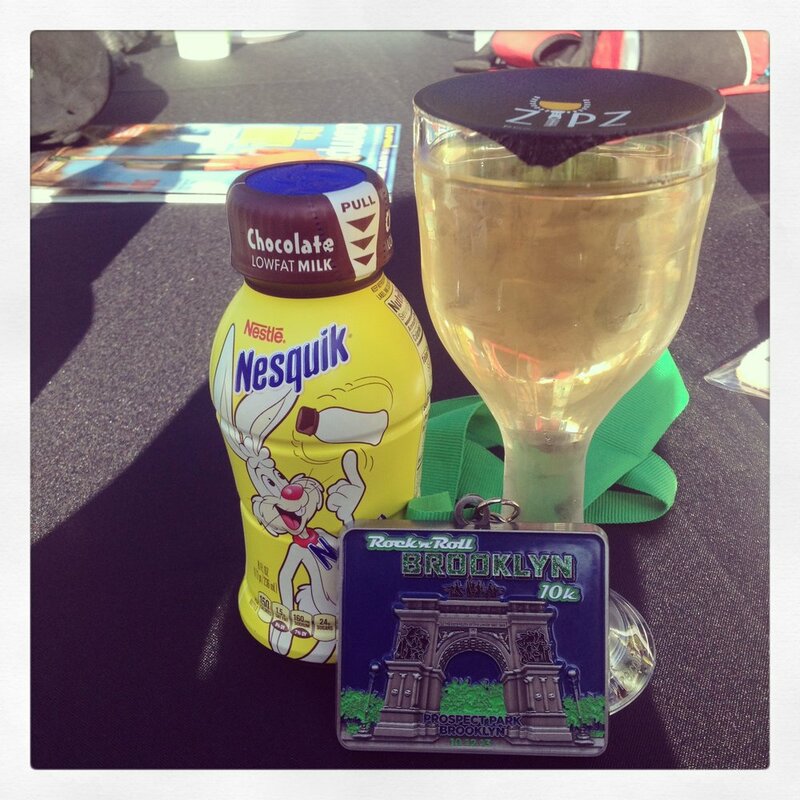 After we collected our bling, we headed straight to the Team Chocolate Milk tent to refuel. While we were there we bumped into my friend Haley and her sister. How small of a world is this race, huh? While Briana waited to pick up her heavy medals and swag, I headed to the VIP tent. I headed straight to the massage line to get my name on the list then noticed that the race actually had mimosas! YAY! Usually it is only Michelob Ultra in the tent (at least in 2015 and 2016) so I was psyched to see mimosas. After a relaxing massage and some food (which came out a little late), I bid Andrew and Briana adieu and headed back to Margo's apartment. As was our tradition, I met up with a few of my Fitbloggin/blogger friends for a celebratory lunch and afternoon of catching up. I freakin' love this tradition of ours. I had a 7pm train home and the adventure was over as quickly as it began. Overall, Brooklyn is the closest RnR race to Boston at least for me to get to. While the expo isn't very exciting, the race atmosphere makes up for it. While I will lose my legacy status next year, I've enjoyed all of my miles full of smiles in Brooklyn! Disclaimer: I did receive complimentary entry into this race as a RockNBlog ambassador, but all opinions are my own. Ain't nobody got time for lyin'!